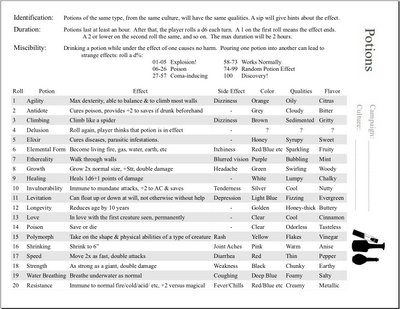 Here is a single page that has the rules for potions, and 20 standard potions with flavors and qualities for a certain region/culture. I had a vision of the perfect blogging product. It would be a clean minimal framework like this that was entirely editable. I hoped to do this with LibreOffice's Write, but the form text boxes are just too clunky. Maybe you can do it with Adobe software or something else. Imagine that you could edit each of the numbers on this list from d20 to percentile so you could weight entries to your liking. Imagine leaving all these potions the same and changing their qualities to that of potions of goblin manufacture. Anyway, I couldn't achieve that, so I'll give you the Write file that you can edit if you want. I had a heck of a time fitting the info. 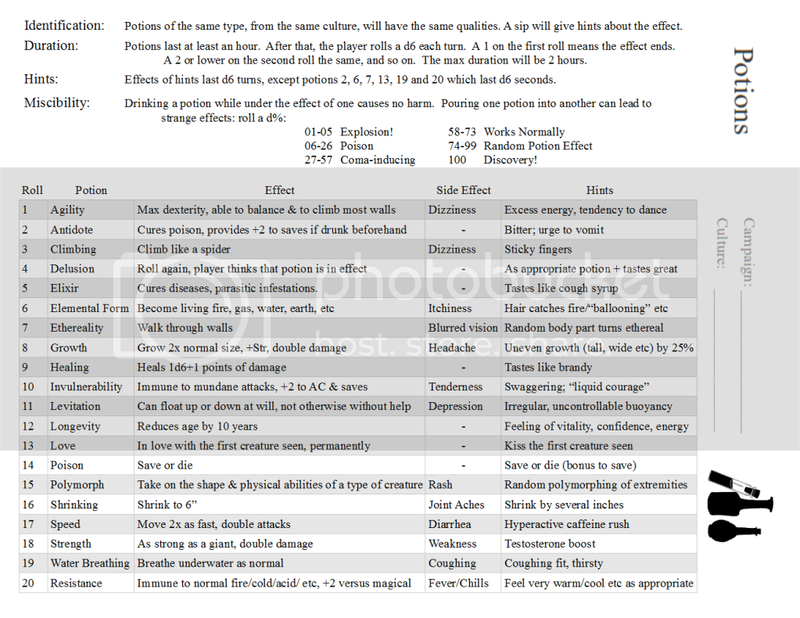 The side effects probably need some description, the potion mixing chart doesn't gives specifics, etc. I even cheated a little by allowing for fire/cold/acid resistances to be listed under one potion. I did the same for elemental form, figuring Elasticity could fit under it too. But I really wanted a single page so I can find it in the heat of play. I put the bottle pic because I noticed that the more charts I have the harder it is to find something because they all look the same. So a simple image to signal what each chart is about. Update: Trying to minimize more, I was able to cut the whole Color column by making the Quality backgrounds the potion color. But it might look better if you just printed in B&W and then use markers or crayons to color. I'm going to do this for myself because seeing red is faster than reading red. John made the great suggestion that there should be a place for the hints of clues players will get when they sip the potions. I'm having a hard time fitting it, even after cutting the Color column, but if you care less about the Qualities/Flavors see the comments below for an example of How he did it. 2. It should be possible to rig up Excel or an open spreadsheet so that you get a different random assortment on each refresh. 3. Side effects are interesting but (like the explosion) I found myself wanting more of a clue as to the mechanical effects. 4. Elemental Form is way cool. 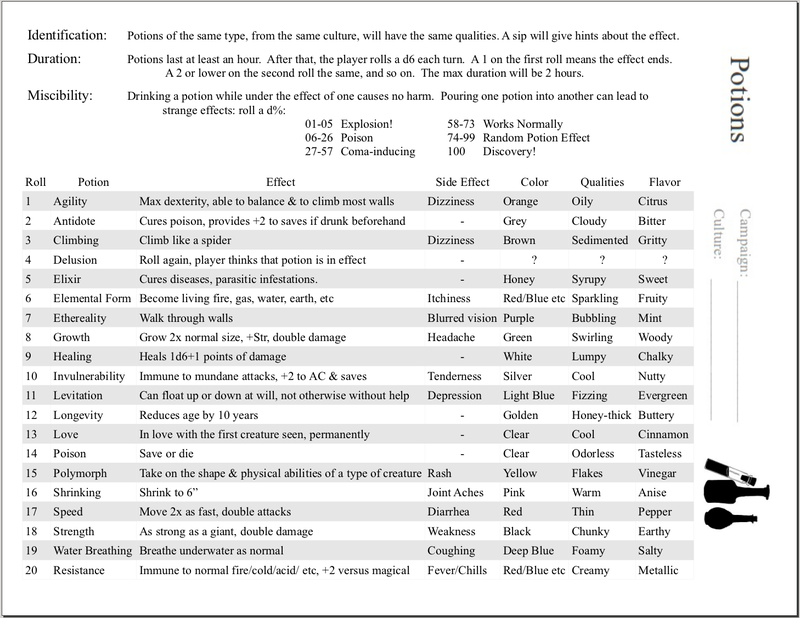 In line with what I was getting at on the last page, you've listed the colours, textures and flavours of each potion, but I don't see why those qualities shouldn't just be made up on the spot. They don't seem to be of much help in identifying the potion - that a liquid is purple, bubbling and minty doesn't exactly scream "ethereality" - so they don't seem to be especially important. On the other hand, if a sip of the potion turns a random body part ethereal for a few seconds, giving you an opportunity to wave it around and get it stuck in a table, that's much more informative. Here's how I would do the chart. Most of the effects are off the top of my head, so they may not be the best or most appropriate, but it gives the general idea. It has been "thieved." Good work! I'm becoming very interested in simple, stripped down information that has permutations built in. This chart does that nicely! Thank You! Thanks all! I'm glad you find it useful. @Roger: 1) absolutely, not too many or visual clues wouldn't be worth paying attention to. Maybe pairs with similar colors? Slightly different shades of the same hue? I had poison colorless, but now I think it should be the spoiler that can be in any color. 2)That would be cool, I only used excel a bit in a job years ago and haven't messed with spreadsheets since. 3)Yeah, there is some overlap with drugs. What if I did a one-page of status effects that could be referenced by a lot of other pages: Poison, Madness, etc? I would rather have it self-contained but just couldn't fit it. @John: I realized last night in bed "Aha, he means a hint column where you could keep track of those," and then I woke up to find you had already done it. Awesome job. I guess I won't feel too bad about not thinking of it because you were able to mod the chart (hopefully easily) which was my even greater desire, to make it customizable. I like how you included some tastes in the hints. Thanks for sharing that. @Zak, Anon, Ravenseye: Thanks, hoping to make more stuff you can use. @heyjames4: The awesome of that post is imploding my head. I think blogger is cutting off some of your tables, but love the scaling protection ring, turn a potential piece of junk into an heirloom with a little rule, and the idea that "Sure you can where more than two rings with some side effects." Great. Great stuff. If I can find the time, I might try to make a randomized version in a spreadsheet for folks. Thanks for sharing! @heyjames4: one trick you can do is take a screenshot, trim it in an image editor and post the image. I appreciate you reposting that table and the wands/staves stuff is great too. @Jim: If you could, that would be super cool.